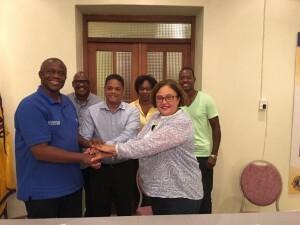 WILLEMSTAD - Last night, the leaders of three political parties signed an agreement for the formation of a new government for Curaçao. The political parties that have agreed to form a government together are the winner of the elections, PAR, with MAN and the new party of former Minister of Traffic, Transport and Spatial Planning Suzanne Camelia-Römer, the PIN. The agreement between the three parties was obvious, given the cooperation in former coalitions. The parties have agreed to work together on a coalition government based on stability, integrity and order. Together the three parties will have a majority of 12 of the 21 seats in Parliament. As was announced, the leader of the PAR, Eugene Rhuggenaath will be Curaçao’s new Prime Minister. The Ministries have also been divided between the three parties. PAR will get 4 ministers, MAN also 4 and PIN 1. PAR will be responsible for the Ministry of General Affairs and Oil Refinery, which is also the Prime Minister, the Ministry of Education, Science, Culture and Sports, the Ministry of Traffic, Transportation and Spatial Planning and the Ministry of Justice. MAN will be responsible for the Ministry of Finance, the Ministry of Economic Development (including Curoil, Integrated Utility Holding, Aqualectra and Buskabaai Inc.), the Ministry of Social Development, Labor and Welfare, and the Ministry of Government Services, Planning and Policy. PIN will get the Ministry of Health, Environment and Nature.